Sleeping Tree’s is a resort on Sunset Beach which is on the island of Koh Rong Samloem in Cambodia. There is plenty to do on the island and here at sleeping trees. 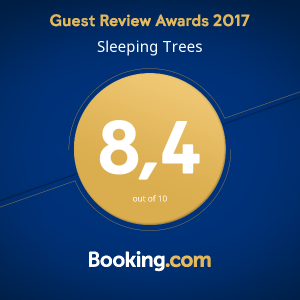 Sleeping trees has a volleyball court, a Pétanque field, a dart board, a pool table and many other games. If your idea of a visit is to be active or to relax and do nothing then this is the perfect place for both. We have giant 3 person or less hammocks, single person hammocks and many other relaxation spots all over at Sleeping Tree’s. A daily highlight is the incredible sunset that can be seen right from our location. Grab a cocktail, relax and watch mother nature put on a spectacular show of colour as the sun slips over the horizon. Sunset beach is a 800 m stretch of golden sand. The sea is filled with fish which can be spotted at the 2 snorkeling spots just off shore. At night (better when the moon isn’t bright) you can marvel at the sight of the phosphorescent glowing plankton as you swim. A shake of your hands underwater will reveal the magic that the glowing plankton provides. If you are a star gazer than the no-lights on the island after 10pm makes for a beautiful and unblemished view of the constellations, flying stars and the international space station (Luck permitting!). If you are a diver then Cambodia’s southern coast (where the island is situated) has some of Southeast Asia’s best diving. You can just grab equipment and explore the coral reef on your own or sign in with our neighbors, The Dive Shop Cambodia, to take a PADI course, do the one day introduction or just join for fundiving when already certified. Koh Rong Samloem is a jungle island filled with birds, monkeys and a diverse set of reptile, and bug species. Remember to bring mosquito spray! We are conservationist and believe that a place as beautiful as this needs to be preserved. Remember to leave only your footprints and take only your memories.